The comments were full on our Tea Party post so please continue the conversation here. You may read the October New Book Releases Tea Party post below and read the great comments, too. Sorry for the inconvenience, but we have such a great turn out and we didn't want the fun to cease. Winners of the blog giveaways will be posted in the side bar with the town crier symbol! There are lots of freebies and giveaways on the Facebook event page, so please check out that page as well! Since we had quite a turn out and you were all so patient with the tech issues, we have a bonus giveaway of a quill pen to an additional winner! This has been a great tea party! Broke the comments limit again! Yay us! We have so much fun!! Love seeing your familiar faces, ladies! Thanks! It's been busy on FB. Whenever I type, there's another new post! Awesome party. The Facebook event has been hopping!! So much fun! And nice nice giveaways there, too! Sorry I missed most of it. Thank you for everything you do. Oh, its really all right there for you to see anyway. Thanks for coming by! These parties are so popular! I know! Can't seem to post something in sequence without another post up already! Love the theme parties! So, how long does this and the FB parties last? Until all of the tea and gingerbread is gone! I guess it is officially ends at Midnight. It kind of dwindles on its own. I can only stay for another half hour....I will have to make dinner and then I will be taking care of my grandson. It's been a looking day. That should say long day, not looking day. Ugh! Definitely a LONG day. Thanks, Faith. 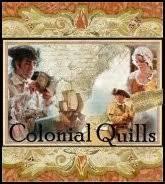 We always love spending time with you and are Colonial Quills friends. 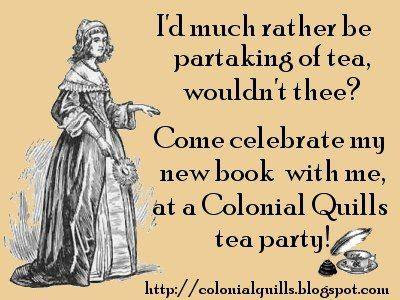 I have enjoyed this tea party very much. I have, too, Jan. We have such a great time! Thank you for coming! This was a great tea party! I think it is wonderful that you had such a great turn out. So glad you could join us today, Wilani! I missed a lot, too, but it was FB/computer issues. Ladies, thank you so much for having the party for us despite some major events you encountered. I know we would have understood had you decided to reschedule. Prayers and God's Blessings to each of you (and everyone here today). Thank you! And we do appreciate the prayer. I don't think a single one of our books could have been written with out the faithful prayers of our friends, family, and readers! Thanks to each of the authors who contributed to the tea party - I look forward to reading each of your beautiful books/stories, congrats!! Thanks for the wonderful giveaways. I left numerous comments on the previous blog page which didn't post, although they were included in the count. Thanks so much, everyone, for being so gracious about the Blogger issues. Maybe some day they will perfect it, but in the mean time tea and gingerbread for all!! I'm used to us breaking the comments limit....no worries! Try #3. I love coming to the tea parties. You all have such wonderful information that you share with us. This month is no different. All the new books look great. Thanks for all the giveaways too. Thanks, Debbie. I'm so sorry for these technical issues! Thank you for your perseverance. We enjoyed spending time with you! Third times the charm! Hey Deb! We have quite the wide selection of books! Thanks for celebrating! God bless you, too, sweet Chris! Ladies, congratulations on your releases! I pray they continue to be a wonderful blessing and success. Thank you for spending time with us. I am looking forward to the November tea! Have a great evening! Sweet dreams. Andrea Boeschaar has a new release in November and will be celebrating! Sweet Dreams!!! We are really getting such a great crowd. Lots of new faces and many familiar faces like your own! So glad you came! Hi Maxie! So great you could be here! I had a great time. 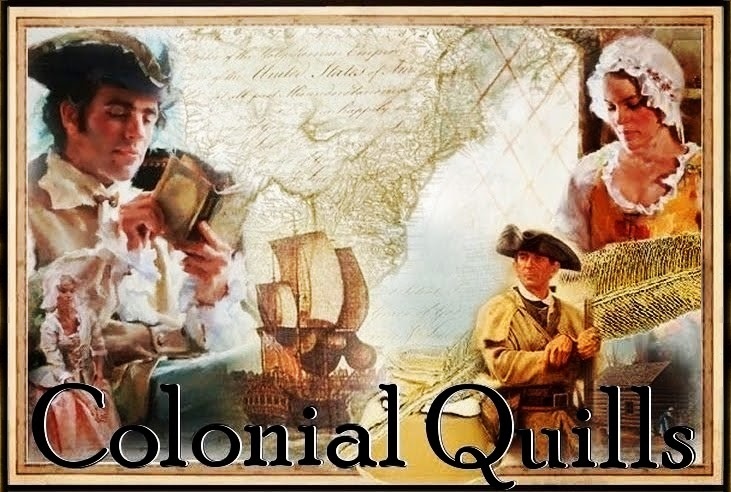 Thank you, to all the authors/hosts, Colonial Quills Blog and guests at the party. It was fun and entertaining. Great releases and I look forward to reading every one of them. Thanks! Best wishes, Just Commonly! So glad you could come by! blessings! Isn't it fun confusing blogger? Haha! I look forward to breaking it again! Yes, Blogger gets upset with us and shuts down! But Carla helped us out of our conundrum! Love gingerbread. Wish I had some right now. Guess I will keep munching on some pecans. My heroine, Sonja Hoeke, is not much of a cook. But if she keeps practicing maybe her gingerbread will improve! Try mine instead! That was Constance's problem, too, Carrie! She finally got it right. It's really an easy recipe. Maybe someone with my cooking skills can even get it right! It was a lovely party.. I'm ready for another cuppa tea & gingerbread sounds delish! Spearmint decaf green tea interest you? Well, I must say goodnight, my friends! This party has been fantastic! Hugs and God bless! Goodnight Chappy Debbie and thanks for celebrating with us!!! I couldn't make it to all but did post some and in btw. Doing stuff for the possible Transplant I was spying. Lol. As I can I will look at all the Authors that came. Keep up the great work. Much Love for getting me a new hobby (one that I plan to keep)! So glad you enjoyed spending some time with us! We sure have a ball! Praying for you Tina! Hugs! Had to stop back over and say Thank you Carrie for my winning your book ! I love these parties a lot and didn't realize how much I had missed them over the past year ! Like I told Carrie I plan to do more reviewing and influencing again, it is a great way to relieve stress in life and escape into another time for a while. Justina, I will be praying for you to Dear ! Love to Everyone ! I'm looking forward to receiving my fancy lovely elegant quill pen. I'm so happy to have won something in the giveaway.